Diabetes is a disease resulting from the body's inability to utilize the simple sugar glucose to make energy. There are two main forms of diabetes—Type 1 and Type 2. Gestational diabetes is a third form of the disease which may affect pregnant mothers. Type 2 diabetes and gestational diabetes are greatly influenced by weight.1 The more weight an individual carries the greater the risk of these diseases. Type 1 diabetes is an autoimmune disease characterized by the body's lack of ability to make enough insulin. Type 2 diabetes is characterized by the body's inability to properly respond to insulin, resulting in high blood sugar levels. Both are affected by diet. Type 2 diabetes is completely reversible through making dietary changes. 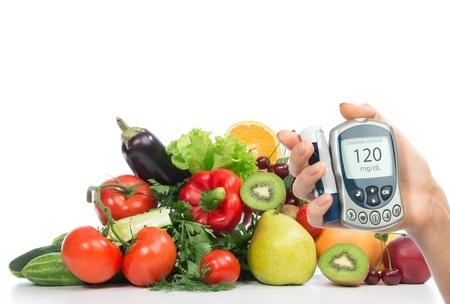 Type 1 diabetes can be improved by proper dietary changes, but cannot be reversed. The starting point for anyone looking to achieve better control and/or complete reversal of their diabetes should be rooted in adopting a whole foods, plant-based diet, along with regular exercise. Meat, dairy, eggs, oils, and processed foods all increase your risk of diabetes.2 Fruits, vegetables, legumes, and whole grains all decrease your risk of diabetes.3 The bigger the changes you make, the bigger the results you'll see. The articles below will help you get started on your path to a healthier you. Carbohydrates - Are They All Bad? 1 Bao W, Yeung E, Tobias DK, et al. Long-term risk of type 2 diabetes mellitus in relation to BMI and weight change among women with a history of gestational diabetes mellitus: a prospective cohort study. Diabetologia. 2015 Jun;58(6):1212-9. 2 de Koning L, Fung TT, Liao X, et al. Low-carbohydrate diet scores and risk of type 2 diabetes in men. Am J Clin Nutr. 2011 Apr;93(4):844-50. 3 Barnard ND, Cohen, J, Jenkins DJ, et al. A low-fat, vegan diet improves glycemic control and cardiovascular risk factors in a randomized clinical trial in individuals with type 2 diabetes. Diabetes Care. 2006;29(8):1777-1783.